At the conclusion of every one of these contests, when the time comes to announce the current winner and runner-up, I’ve increasingly begun to feel like a broken record. But it’s true. You guys are making our jobs seriously difficult here at HTN by submitting such striking, accomplished work. That’s a better than worse problem to have, of course, but it certainly adds layers of complexity to the situation. But, please, keep up the great work and keep submitting! As usual, a big, hearty thank you goes out to our judges for this go ’round, who graciously devoted their precious time to help us out: James Ponsoldt, whose The Spectacular Now opens theatrically on August 2nd through A24 (seriously, see this movie! ); Kate Brokaw from Tribeca Film; and our December ’12 contest winners Zach Wigon and Mauro Mueller. Be sure to check in on our Main Contest Page for updates about the launch of current and upcoming contests. But for now, let’s focus on this contest! 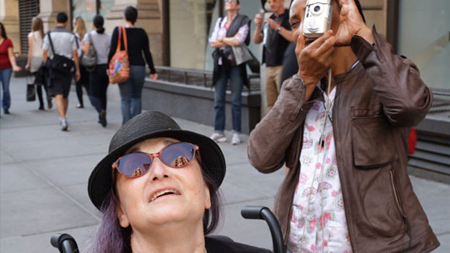 Riley Hooper’s affecting documentary about New York City street photographer Flo Fox is both an eye-opening portrait of an artist you likely haven’t heard of, as well as an inspiring story of how an individual’s creative spirit can conquer the most crippling of physical ailments. Suffering from multiple sclerosis and relegated to a wheelchair without the use of her hands, Fox nonetheless continues to capture striking images through the lens of a camera. FLO is a testament to the power of creativity, and a celebration of a true visionary of the streets. Juror Zach Wigon had this to say about Lauren Wolkstein’s provocative winner of our Summer ’13 contest: “an enigmatic film that understands that adolescence is about alienation and adolescent sexuality is about self-consciousness.” Wolkstein has been traveling the shorts circuit for years with films like Cigarette Candy and The Strange Ones. This time, she left America behind for France, and, in so doing, has revealed a whole new filmmaking dimension. Starring the great Anna Margaret Hollyman, Social Butterfly is an excellent example of how to accomplish so very much in so little time. Read my full HTN review.